My birthday is this coming Friday, y’all. Feel free to send gifts. Or chocolate. Heck, I’ll take an e-card. Or nothing. It’s not that big a deal. Every year, I bake my own birthday fantasy treat. When you’re the resident cake baker, nobody bakes them for you. It falls to me to make the festive sugar. But that’s okay, because I get to let my imagination run wild. 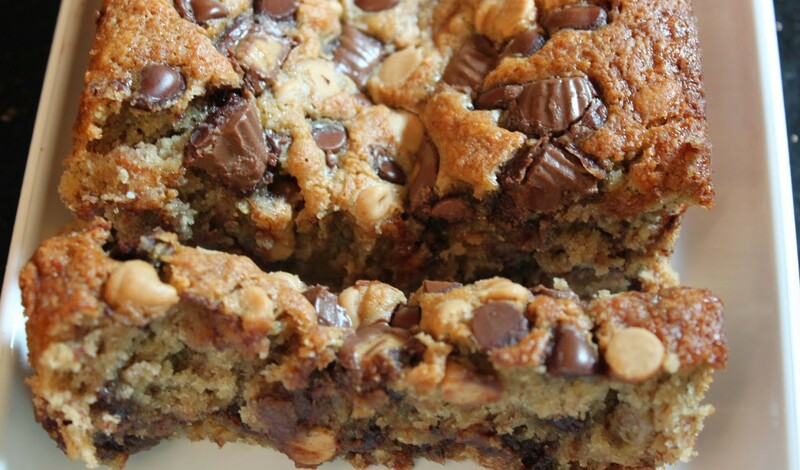 This cake is like a giant Reese’s peanut butter cup. 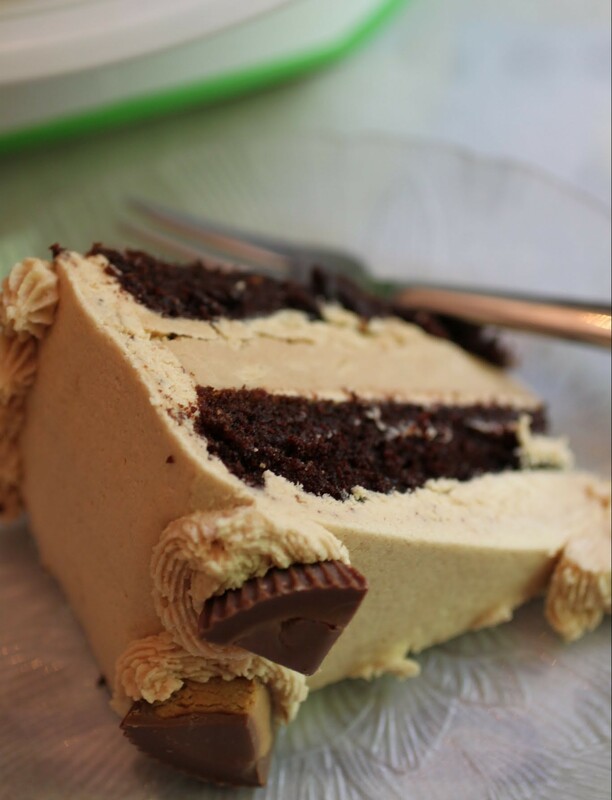 A peanut butter core is sandwiched between my favorite chocolate cake (it’s gluten-free but superior to any chocolate cake I’ve ever baked, and that’s a LOT of cakes) and then frosted with peanut butter frosting. 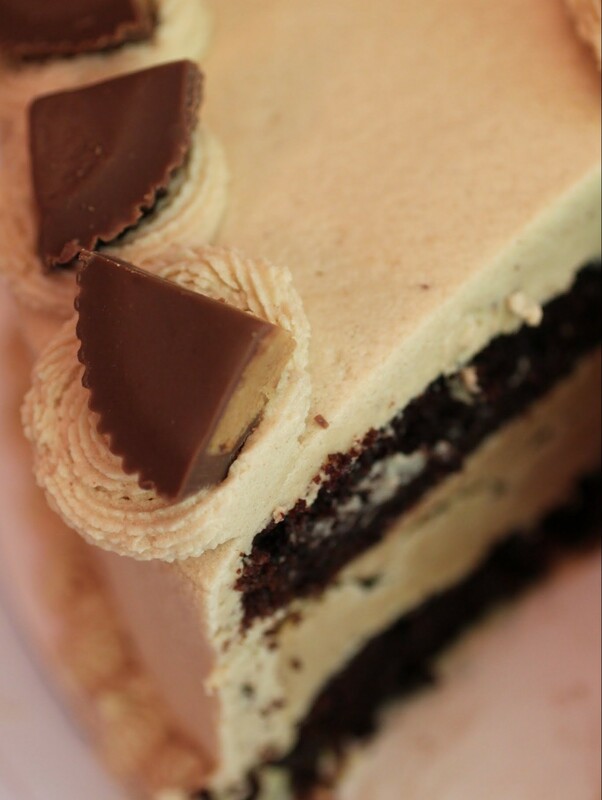 And of course, the whole cake is topped off with more Reese’s peanut butter cups. It’s the best candy in the world, my friends! Today I got my welcome back letter in the mail from the high school where I work. Don’t get me wrong: I love teaching and it’s exciting to go back every year. But could everyone just not bother me until I have to go back? I don’t want to see ads for back to school items, and I definitely don’t want a mailing from my work full of meeting agendas. Thinking about meetings when I’m at the beach soaking up the rays is just so not cool. Before you start thinking that I’m a spoiled you-know-what who gets two whole months off to while away, I have to explain the argument that I have with Kenny on a regular basis. From my point of view, a teacher’s summer vacation is pretty much a furlough. In other words, we’re not paid for those two months, and it’s not voluntary. Granted, I know very few teaching jobs that span an entire school year. Kenny argues that if teachers were to work those extra two months and be paid the same amount, our salaries would still be good. I think that we would have to make an extra two months’ worth of money, because then we’d be 12-month employees, not 10-month. And it’s not like teachers aren’t underpaid anyway. So what this comes down to is that when you think you’re seeing a lot of teachers on vacation, several are working extra jobs or cutting back on expenses to compensate for the absent paychecks. It’s just something to consider. I know very few teachers who don’t have summer gigs to help everyone stay afloat. Back when I was a rookie teacher with no money, I actually kept my expenses outside of basic needs to $40 a week. I still don’t know how I did that, but I remember budgeting out a movie, or a candy bar, or if I saved up a bit more, a cool vest. It was easier to do that than to teach summer school. But back then, I was young and energetic. Now, I got nothin’. Except THIS CAKE. I had to put that in caps because, well, it’s a crazy awesome sugar bomb punch. I have a pretty high tolerance for desserts that other people consider rich, but this one packs a lot of intensity. Half a slice got me through a few hours. You can bet that on my birthday I’ll be pulling this cake out of the freezer for partying galore. After all, I still have some summer vacation left, even if it’s dwindling fast. While the sun shines and the seagulls caw (is that what seagulls do? ), let the celebrations begin! Preheat the oven to 350. Line two 9-inch round pans with parchment rounds and coat with cooking spray. Pour the batter into the prepared pans. Bake for 25-35 minutes until a toothpick inserted into the center comes out clean. Cool the cake rounds for five minutes. Carefully invert each round onto heavy-duty plastic wrap and seal the cakes. Cool completely. Place each round in the freezer overnight. In the bowl of a stand mixer, beat the peanut butter, powdered sugar, and butter until crumbly. Gradually add the heavy cream, beating after each addition until the peanut butter mixture forms a dough. Press the peanut butter dough into a parchment-lined and greased 9-inch round cake pan. Turn the round out onto a cookie sheet and cover. If you have trouble turning out the layer, lightly run a knife along the edge once to coax it out. Place the peanut butter layer in the freezer and leave it there overnight to become solid. When you're ready to frost and stack, make the frosting. Cream the shortening, butter and peanut butter until smooth. Add the powdered sugar and mix again. 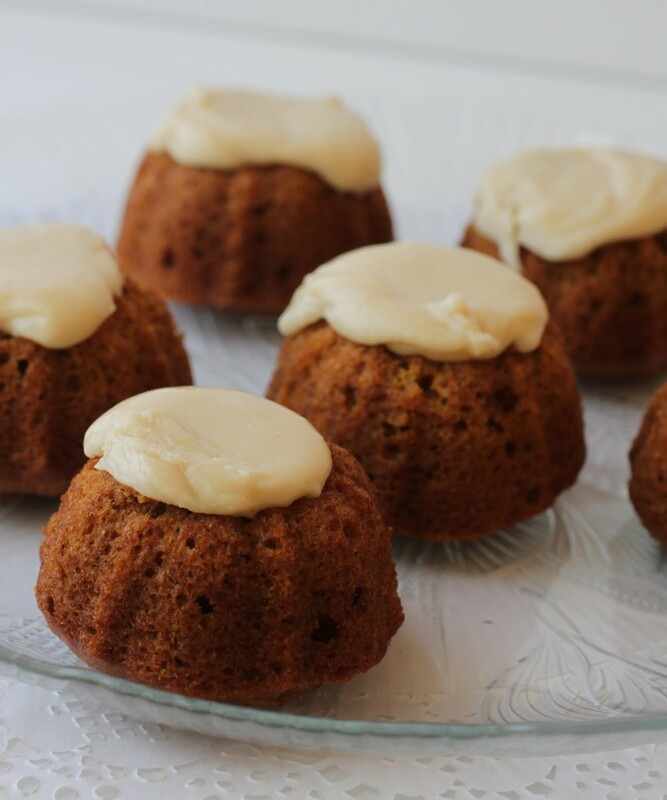 Beat in the milk so that the frosting is a spreadable consistency. Let the frosting run in the mixer for a few minutes to become light and airy. Spread a little frosting on the surface of your cake plate or cardboard base. Unwrap one of the chocolate layers carefully and place it on the plate. Spread a thin layer of the frosting on top of the cake. 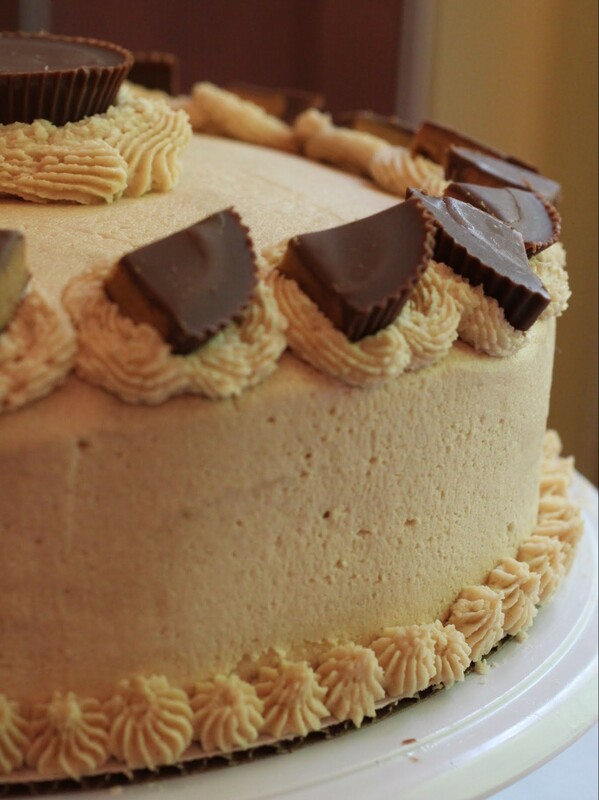 Carefully place the peanut butter layer on top of the chocolate layer, being sure to level either layer when necessary with a serrated knife to keep things even. 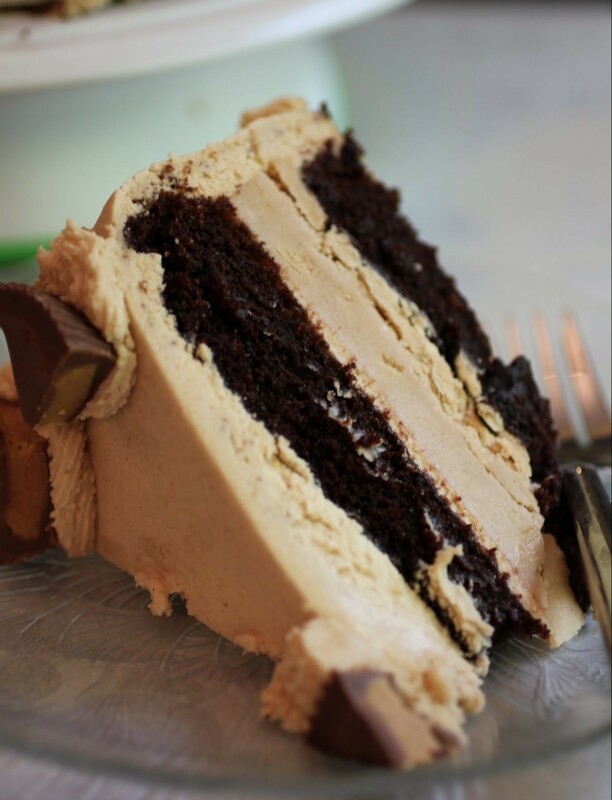 Spread another thin layer of peanut butter frosting on top. Unwrap the other chocolate layer and center it over the middle layer. 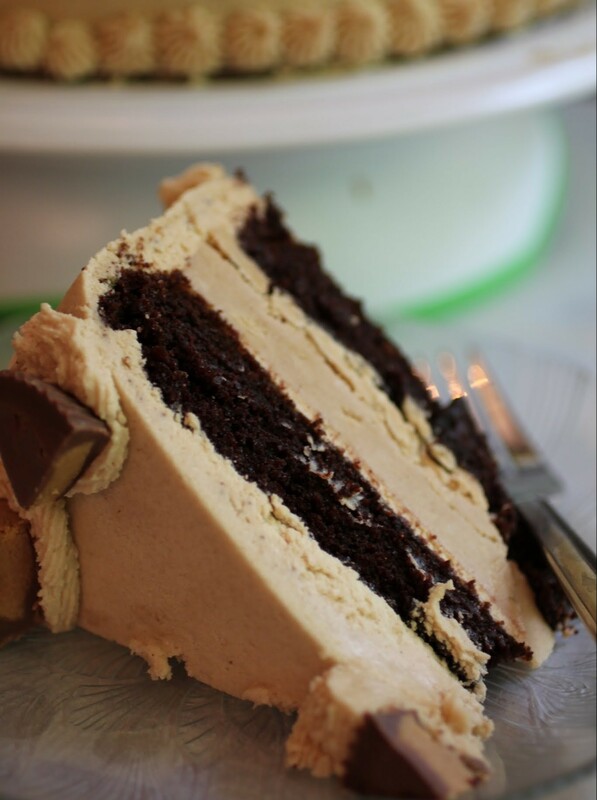 Frost the cake generously with the peanut butter frosting. The cake is very moist and may crumble if you're not gentle, so use caution. Do a crumb coat and chill the cake before doing a second coat on top. Smooth out the frosting. If desired, pipe swirls onto the cake with a star tip. Garnish with full-sized peanut butter cups. Chill the cake to set the frosting. Bring to room temperature before cutting into wedges. Here it is, beautiful readers! My last installment in this week’s browned butter series. I hope you’ve enjoyed this week as much as I have! Today’s offering is inspired by Kenny, a.k.a. my non sugar-craving half, who thinks all desserts are too rich. 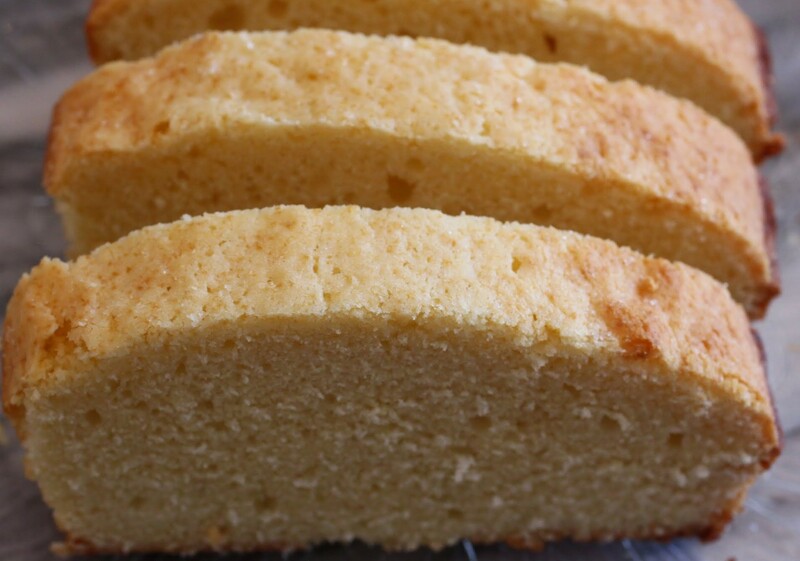 I love pound cake, but he has two bites and puts it aside. So I decided to halve the butter, brown it, and see what happens. Verdict? Success! Happy early birthday, Mir! August birthdays are the BEST (mine is at the end of August)! 🙂 This cake looks amazing! Love the peanut butter in here. What a perfect treat to celebrate with! Yay for August birthdays, Gayle! Fitting into clothes is something I think about in general, but not on my birthday. And you exactly prove my point about teachers working. Most of us can’t afford those two months off! Teachers totally deserve those 2 months off, as the teachers I know work crazy hours during term time. Agreed, Dannii. I work hard enough during the year, it’s true! The workload is INSANE. Thanks so much, Heather! Every day is precious, it’s true! Rich cakes are definitely the best Mir! This looks so delicious. 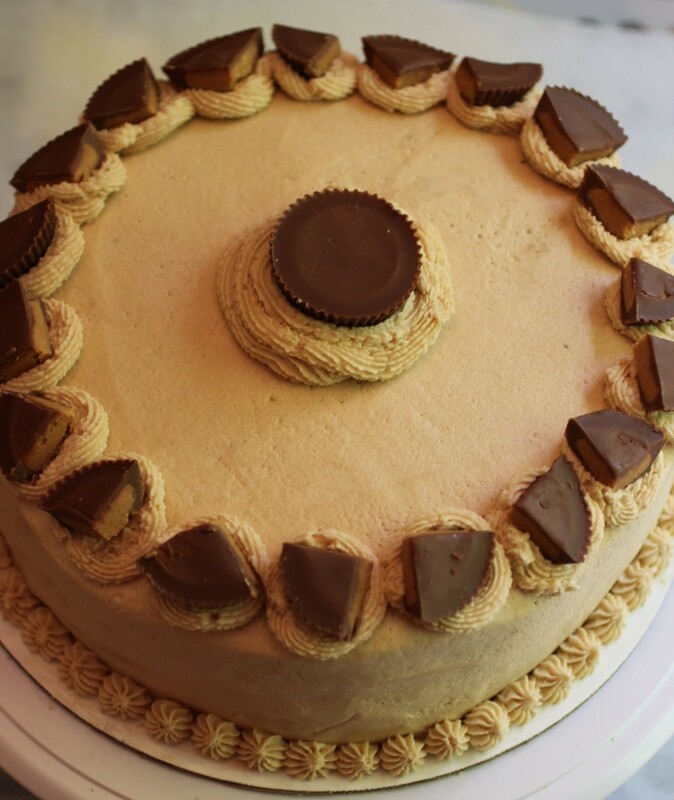 I’ve never seen a peanut butter cup cake like this before. The frosting looks so amazing, and I love the peanut butter cups on top. This is definitely perfect for birthday celebrations!!! Happy early birthday!! Thanks, Harriet Emily! Rich cakes ARE the best. I can’t think of a better way to do it! Love peanut butter! This cake is gorgeous! My sister’s b-day is on Friday 🙂 Hope you have a great one! Your sister and I are birthday twins, Mira! Yay for August 14! It’s the way all birthday weeks should start, Manali! Mir, your birthday is coming up!!!! As I get older, I don’t like calling attention to my own birthday but LOVE celebrating others!!! This cake is everything I would want in a birthday cake! Down to the peanut butter layer, frosting and peanut butter cups on top!!! and I hear you. . lately my energy level has been so way down it’s crazy. . I think it’s because I’ve been traveling . . but I gotta nip it in the bud soon. . I hope you have a fabulous birthday and enjoy every last bit of summer!!!! I have so much respect for teachers. . you have no idea. have a fabulous week!! I guess I like to call attention to it so that Kenny doesn’t forget and then I wind up all angry without a present. 🙂 But yep, I’m not excited about getting older. I’m closer to 40 than 30. That is just not okay. And it’s only going to get worse! Get some rest and I hope your energy goes back up! This is a PERFECT Birthday cake! It’s so decadent and I love the peanut butter and chocolate!!! Enjoy your summer! One of my dance teachers is, in addition to teaching dance and running a company, a preschool teacher during the year. And sure enough, to compensate during the summer, she is a dog walker- even though her dancing picks up during the summer as the studio has many camps. Teachers don’t have it so easy all the time! This cake looks awesome 🙂 I love how thick that peanut butter core is! Happy early birthday! We don’t have it easy pretty much most of the time, Medha! But we love what we do! Thanks! I am totally with you on the PB AGAIN! LOVE! I don’t love that you make your own birthday cake, but at least you get to have fun and get what you want! Will you make this for me on my birthday? It’s St. Patrick’s Day – I’m just sayin.’ All my teacher friends work second and third jobs in the summer. Bummer. That looks like the richest, most wonderful birthday cake ever! Peanut butter cups are the best. Happy Birthday! They are the best ever. Thanks, Stacey! Oh my gosh Happy early Birthday!! I hope it’s the best day ever. This cake would make it that for me! Thanks, Dorothy! I had to make a cake because, you know, nobody else can. It’s the baker’s lot in life! Happy belated birthday! Your cake looks so yummy and the chocolate layer looks so rich and fudgey. I love cakes like that. Thanks, Linda! It’s very chocolatey. My favorite thing, too!